Yesterday was an exciting day for us. We drove about an hour north to a bee yard and honey processing facility in Ashley Ohio to pick up our very own four pound box of honeybees. 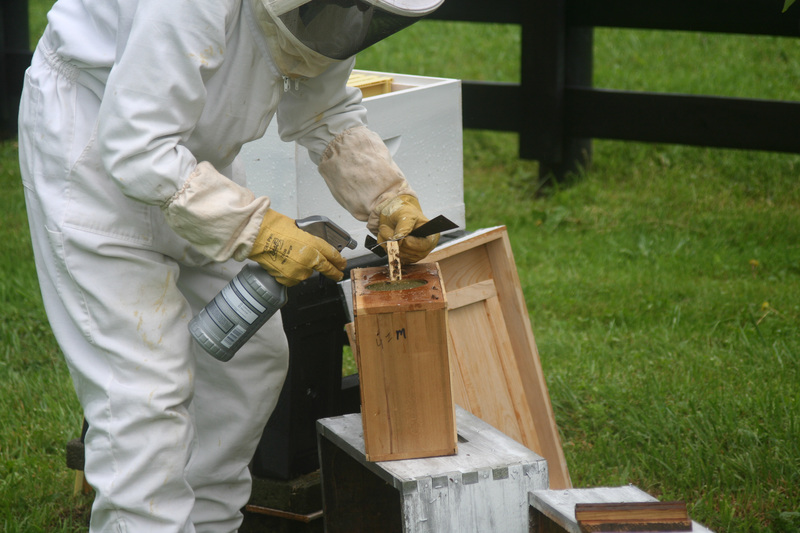 My husband has been a beekeeper, on and off, for about 10 years. We have only harvested honey once in all that time, preferring just to have the bees around for pollination of our fruit trees. This year he decided to start a brand new hive, with all new boxes and frames. 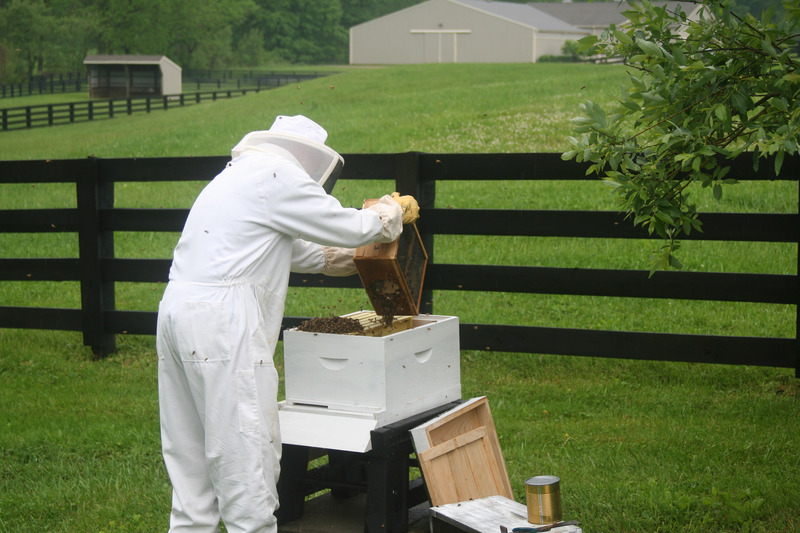 The hive, purchased from Rossman Apiaries, was ready to receive the bees when they arrived. The first task when hiving bees is to prepare a 50/50 mixture of granulated sugar and water (dissolve the sugar in hot tap water and allow to cool thoroughly). The sugar-water goes into a spray bottle and the box of bees is sprayed liberally with it to calm them. Inside the box is a tiny cage where the queen bee is kept while the bees are in transit. 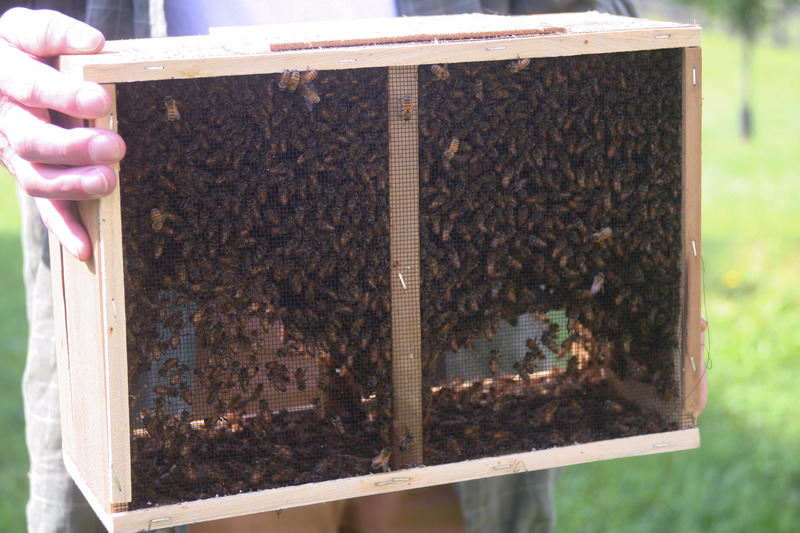 The queen cage is removed and hung inside the hive between the second and third honey frames. Also in the box is a can filled with heavy syrup that feeds the bees during shipment. When the can is taken out the bees can be emptied into the hive. A pile of them is poured right on the queen cage to keep the queen warm. The rest of the bees are dumped somewhat unceremoniously into the hive. It’s important to continually spray the bees with their sugar-water solution so they remain fairly docile and willing to settle into their new abode. 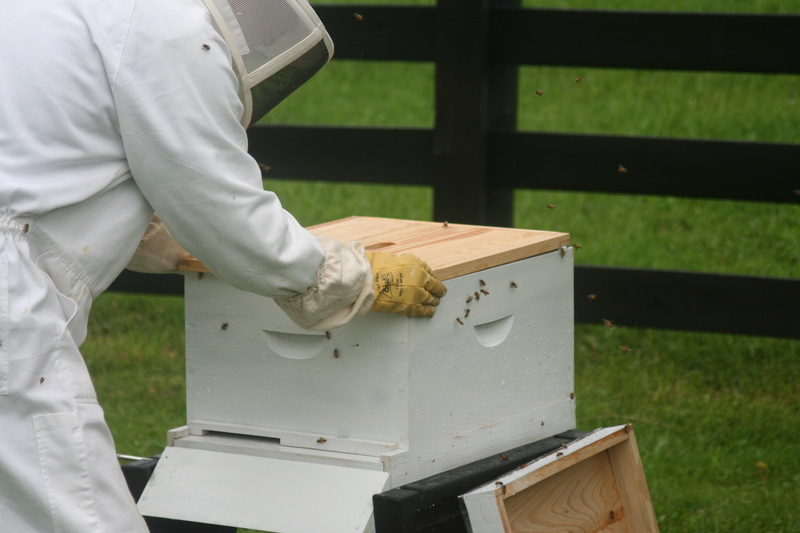 When most of the bees are in the hive, the transport box can be placed on the ground. The rest of the bees will hopefully enter the hive of their own volition. 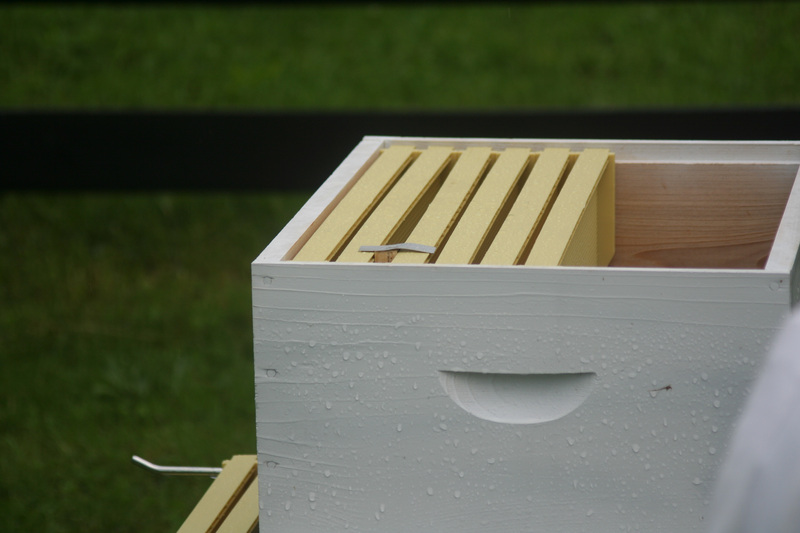 The hive is then lidded, and a Boardman feeder is installed. 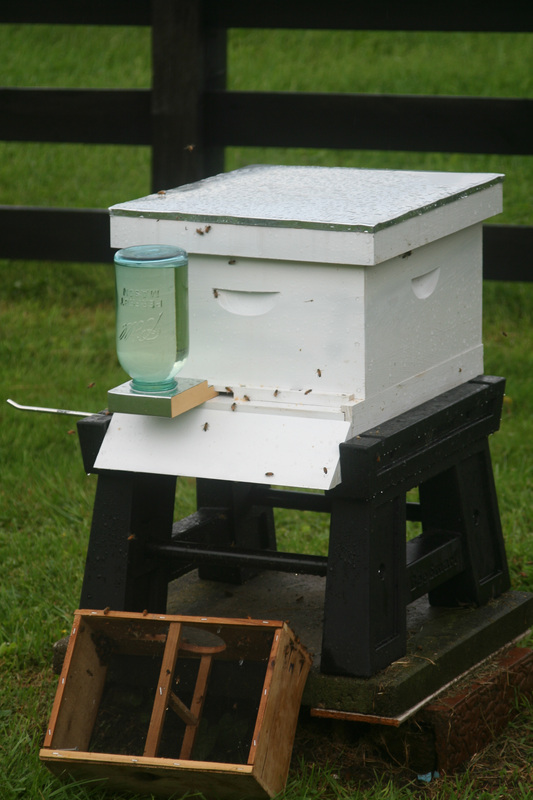 A Boardman feeder is just an inverted mason jar full of the same sugar and water mixture used to spray the bees during hiving. The Boardman feeder is especially important if hiving in the early spring when there is little pollen available for the bees to forage. Later on in the season, it can be removed. Amazingly, my husband was not stung during the entire hiving process. Italian honey bees (the variety we keep) are generally gentle and only wish to go about their business. They don’t sting unless seriously threatened, and they will give fair warning if they believe they are threatened. 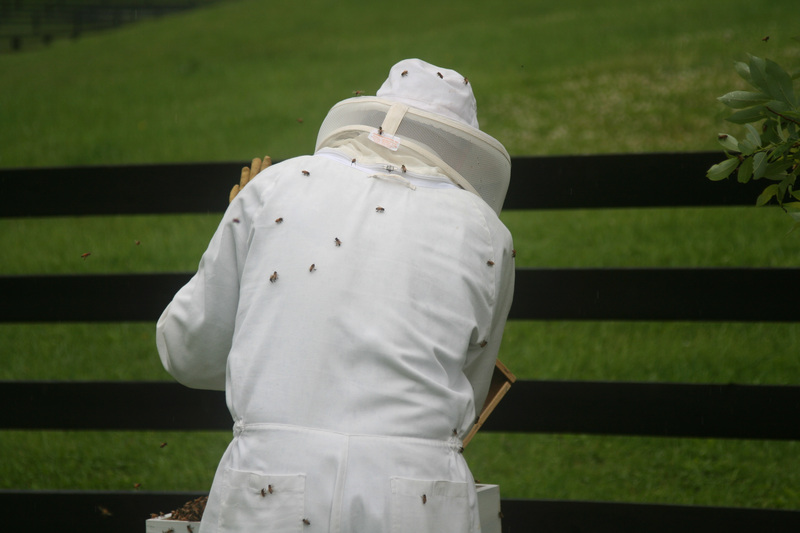 If you approach a hive or a swarm and you are bumped by a bee in flight, consider yourself warned and back off. If you run across a swarm of honeybees on your property and you don’t know what to do, call a beekeeper, never an exterminator. It’s usually possible to hive a swarm. 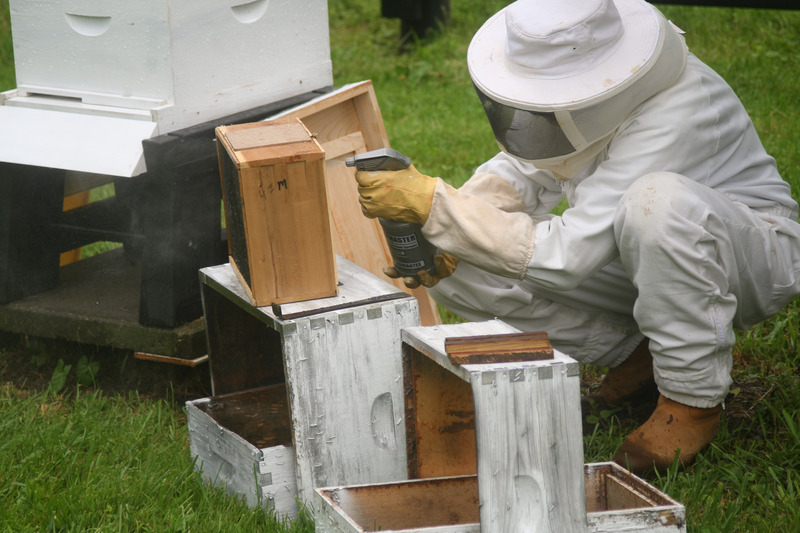 Rossman Apiaries–beekeeping supplies for commercial beekeepers, backyard beekeepers and hobbyists. Great post! I loved learning the details about keeping your own hive. I had no idea about the sugar water. Last summer I discovered a large hive (about the size of a football) hanging from a tree around the corner. It was fairly high up, so I’d not noticed until the hive got to be so large. I can’t imagine how long it took the bees to build it. Previous Previous post: Do you see her?